Social networking sites are enormously fun for you to expand your online relationships and network within a vibrant and thriving community! Women In Medicine Magazine makes it easy for you to network with like minded professionals. At a glance, we have developed our social network from the ground up with many features that will make networking a breeze and provide you with the most satisfaction! You can easily enable social networking to collaborate with your community with features such as activity streams, your photo gallery, video support, organic groups, event management, social graph management, customise your profile, private messaging, external social network integration and many more. Women In Medicine Magazine provides a top social network for you. This Is Where The Fun Is! The fun begins when you start to upload your photos. Our clean and fast photo uploader helps you to easily upload a bunch of photos at once. It automatically queue up the photos and upload them one by one. Your server will thank us for that. Uploaded photos will be shown up as thumbnails so you can easily check if you've missed any photo. Viewing photos on Women In Medicine Magazine is a pleasant experience, even when your Internet connection is slow. Thanks to AJAXified photo viewer, the next photo will be displayed without page reload. This will save bandwidth, use less server resource and it is much faster. You can tag your friends, wait for your friends to comment and reply to their comments. Uploaded photo can be arranged to your liking. How? Just drag and drop into the correct order and you are done. After that, don't forget to choose the best photo to be the album cover. Built into the Community is a fully featured video capability, ranging from embedding videos to hosting your own. We provide everything that you need! Our Community supports external video linking. Be it video from Youtube, Vimeo or 10 other major video providers, your video will be always elegantly embedded on your profile or group pages, complete with viewing stats, thumbnail and commenting system. You can also feature those cool videos linked by your friends and group members. Our Community members can display their original videos that you can upload or embed content from other networks. 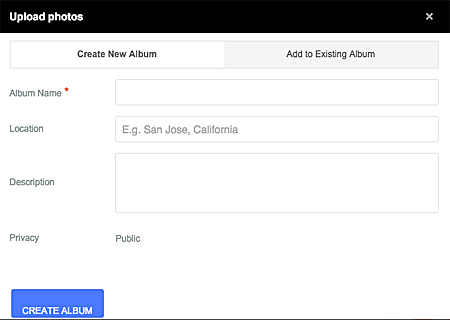 Members can upload to multiple public or private albums. Stumbled upon amazing street dance or that funny sneezing panda video? 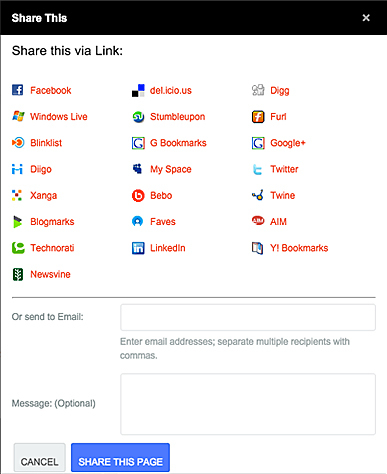 Let your friends in Facebook or twitter know by using our sharing tool. Women In Medicine Magazine's Community supports more than 20 social bookmarking sites. Video and other pages in our Community are equipped with a reporting tool. Members can report any offending video or photo. We can check the report page on the backend and take necessary steps to make sure our Community site is clean and safe. Those little avatars you see at profile pages, they are too common. Now you can sizzle up your profile page with a profile video! Introduce yourself, create your version of a Lady Gaga song, post your favorite movie trailer or anything; be more than just a picture. Successful social networks will have a tremendous growth in membership. New members will keep coming in and at some point, it becomes harder to interact with everyone. Groups to the rescue! With Groups you can recreate a smaller community and make it personal again. Since a group is made up of members who share the same interests, they will surely make an engaging bunch. Make it public or private, it can be fun either way. Public group can be joined by any site members so this is perfect if you want to create a fan club of yourself. If you would like to create a secret society and plan a world take over, private group is what you are looking for. It allows you to hand pick your members. Each group can have their own Photo and Video gallery. You can share the media with your group members. As an admin, you can set to limit media sharing to admins only or open to all group members. Wall post is a general message board while discussion board is more to topic-specified discussion. These are the essential tools to keep your group active. As an admin, you hold the power and responsibility to moderate all contents in your group. You can promote additional admins to help you with this great task. As an option, admins can be set to receive notification of new content or new join request. Everyone loves to find out the up to the minutes’ activities on your community, such as latest wall posts, blog entries, comments, pictures, and videos shared by the members. The Women In Medicine Magazine's Community activity stream system summarizes and displays all activities on one page with links to all of the original items. While the system automatically summarizes the content for the activities to reduce redundancy, it allows you further customize your activity stream features such as aggregated activities and integrate with user points system. Whether it's a gorgeous photo or a funny reply, you will get a sneak peak of it. Current version of activity stream will tell you more about new comments, videos, photos or discussions posted so you can check the interesting ones or ignore rest. One great way to encourage members participation is to reward members with points. Our user points system allow you to reward points to user activities, the more activities the user, the more points are being rewarded. The More Friends, The Merrier! What’s good of a social network if we can’t make friends? We’ve created the Women In Medicine Social Network for you to make lots of new friends, re-connect with old ones, share relationships about common interests or link with other members as professionals. Your powerful search feature makes it easy for you to search friends of a specific criteria. Your social networking community also has a friend invite system where you can send out emails inviting your friends from your address book to participate in your social network. Invite your friends with Women In Medicine Magazine's Invite System. Just add the email addresses from your address book into your profile and send out an invite to get more people you know participating into our social networking community. We know how certain information is sensitive to you and you may not want to share those information with the public. Women In Medicine Magazine understands this and offers the feature to hide information about you that you don’t want the public to know. Women In Medicine Magazine's Friends Approve system, you can choose who you want to be friends with by accepting or rejecting them to be in your circle. If you are looking for members of your community that matches a certain criteria, our search function is powerful enough to produce the results. Let’s say you want to find female members of your community who graduated in the year 2002, use the search function and you’ll find your desired results! Easily manage your events with our Event Manager. Set an event anywhere in the world and it’ll display in the Google maps. Manage your members, set an invite number limit or even send out invitations so that they can RSVP to your event. Set your events with Women In Medicine Magazine so that members are more engaged with each other. Nothing beats meeting your members face to face and having fun at doing that! A meeting at Starbucks won’t go well with 40 people coming along. And a backyard party with 2 friends won’t be a lot of fun. Easily expect or limit how many people should come to your event. Not all events are created equal. We give you absolute control of your event. Is it private or open to all? Allow guests to invite their friends? How many seats are there? It is all up to you. Just enter the address and Google will automatically find the map and display it. Need a hardcopy? Print your events beautifully with the built-in 'Print event' feature. You will never get lost. Venue changed? Again? Don't worry, with our built-in email notification, you can keep all the participants up to date with all the changes. Plus, they can give suggestions through the event's wall. Invite a few or a whole bunch of your friends. They in turn will respond with RSVP system. Now you will always know how many pizzas to order. Women In Medicine Magazine's social networking community makes it easy for you to collect relevant data from our users. From the common profile such as High School and Hometown, you can ask users something more relevant to your group for example. Let's say you want to create a group of women owned dental practices in Chicago. You can easily create custom questions that will collect useful information like what kind of dentistry you practice, when did you graduate dental school and so on. You can then let your members find each other based on various criteria. This search feature would be useful especially when you are inviting members in Manhattan for a quarterly meetup, for example. Plus, you can use this information with our event management or a third party Friend Suggest feature to do some meetup magic! Use it in many ways. Not only does Women In Medicine Magazine's social networking community makes it easy to ask all those questions but it also lets us define which questions are required and which are not. Our new sign ups will appreciate not being forced to fill up optional questions. 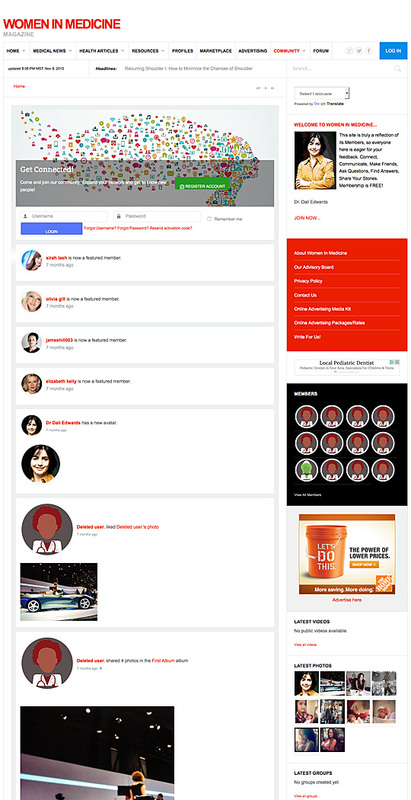 A social networking site has to offer unique features to its members that keep them coming back. Our social network is easy to customize with unique features. Private messaging exists on social networking sites for a reason: Members can do one-on-one private messaging. It is the simple way to send messages between members privately that is similar to email. Private messages cannot be read by any members except for the person it was sent to.You and other members can send a private message to anyone within the community. Members can send and receive private messages on our site; view messages sent and reply to private messages. Each community member's personal inbox allows one to view and manage all communication with other community members, while not requiring that any member explicitly share their email addresses. When a community member receives a new message, an alert will appear at the top of their community page after they login.The messages of your Inbox are only visible to you only. When you message someone, your message goes into his or her Inbox. There will be a notification on that person's community page. Meanwhile your copy of your message will be stored in the Sent folder for your own reference. When you private message, your message can only be read by your selected recipient. To send or reply message, simply select recipient from your friend list on the right, fill in the subject line and your message. It is like email. To make the registration process hassle-free, we've included our new Facebook-Connect login-module on Women In Medicine Magazine social networking community, so our members can log-in to their community using their Facebook account credentials. Adding this to our community site simplifies sign up! In our community, our members can have their very own blogs, post entries directly from their profile pages, and share those blog posts with friends via the Women In Medicine Magazine's integration. Now every member can take twitter inside of our social networking community. With Twitter App for the community, you can post your status update in Women In Medicine Magazine's community to Twitter, retrieve your Twitter timeline on your profile page and if the number is not embarrassing, you can show how many followers that you have. To join now simply click the banner ad below to get started. In a matter of minutes you will have joined the most sophisticated, classy social networking site in the world! Designed for women with an entrepreneurial view of life who have success at the forefront of their thinking! Women In Medicine Magazine.com is always looking for talented, experienced editorial contributors to enhance our online magazine. Our general goal is to have a good mix of substantive articles of interest to women in medical fields. If you think you can help us do that, then read on. Note: that all guest post submissions must be original and not already published elsewhere online. You own the copyright of your article and are free to publish your article elsewhere, but we ask that you acknowledge that it was first published in Women In Medicine Magazine, including where possible a hyperlink to the Women In Medicine Magazine website. Women In Medicine Magazine.com is a magazine for and about women in medical fields and the medical industry. Our mission is to provide a platform for women to express themselves while accessing meaningful, entertaining and exciting content relevant to their careers and their lives. Our online magazine provides content in the areas medical news, career, health, Resources, profiles of women in medicine, medical breakthorughs, community, and much, much more. First you will need to login or register to create a free account on the site then it's free and easy to publish. Once you are logged in a "SUBMIT AN ARTICLE" link will appear in the menu at the very top of the all pages. A "SUBMIT AN ARTICLE" link will also appear under the "Home" dropdown menu. These links, which are only visible to logged in members, will take you to the article submission form. You'll write a title, enter your text (it's easy to cut and paste from another document), choose which editorial category you want your article to appear in and upload a photo if required. We'll provide a complimentary proofreading service. Soon after that, we'll send a “You're Published” email and a link to your article. We are not restrictive on your word limit or style but usually 500 to 2,000 words make for a good article or blog. Writing is an art and we are keen to give you as much freedom to write with your own style and flow. However, you should bear in mind that our target audience is made up of busy career women. Self: In-depth stories related to identity, tradition and issues that medical women face in their day-today life, also issues relevant to audiences of various cultures/religious backgrounds. Culture and Lifestyle: Book, movie, music and concert reviews. Culture analysis of mainstream artists, restaurants, club and bar reviews. Family and Friends: Stories, advice, rants and raves about relationships. We welcome stories about interfaith and interracial relationships, issues and frank discussion about sexuality. Interviews with Successful Medical Women: Interviews with fantastic medical women everywhere. We reserve the right to make final editorial decisions on all articles submitted. Any work published on Women In Medicine Magazine.com becomes the exclusive property of Women In Medicine Magazine.com. Contact Women In Medicine Magazine.com for information on reprinting permissions. We retain the rights to both Internet and print copies of anything published under the name “Women In Medicine Magazine.com”. This site is truly a reflection of its Members, so everyone here is eager for your feedback. Just contact us and let us know what you like or dislike. If there’s a story you want us to pursue or a poll you want us to take, please let us know. And finally thank you for taking the time to read about us. "Hi Impact Radius"